Crafting Real Impressions A sea of change one can observe when it is compared the looks of home from the times before a decade ago and now. In terms of designing, functioning, and maintenance of the interiors ensembles, decorating homes has become quite interesting and attractive prospect to involve self in. Experience the magnificent marine life that will take you by its wonderful appearance. 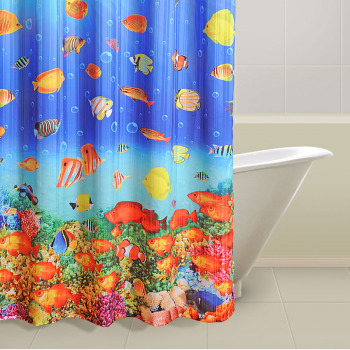 If you have a heart for aquatic life, these beautiful curtains will give you an insight of underwater sea life. Relax in the most beautiful surrounding of marine life with colorful fishes going everywhere. 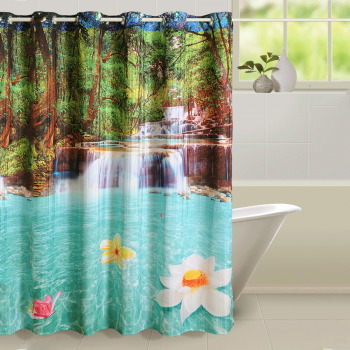 Let the splashes of water rejuvenate you warding off the entire languor of a hard day. Give a way for the aqua green water coming from the high plains to revitalize your bathe time. 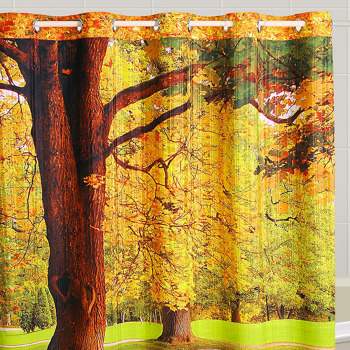 These digitally printed curtains can give you the pleasure of taking a shower in the lap of nature. Tall green trees whose big branches are protruding outwards along with the wide brown stairs dampened by the fresh water are setting a perfect backdrop. Bath in an aromatic ambiance to revive your senses. A sudden flow of energy will come from inside by the end of shower. 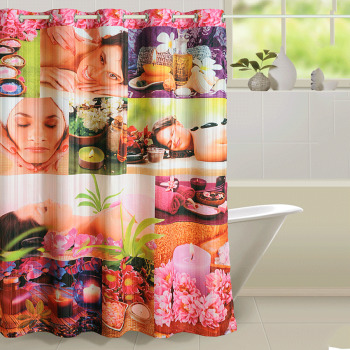 Sweet fragrances will tempt you, hold you, tell you to spend a bit more time inside bathroom. 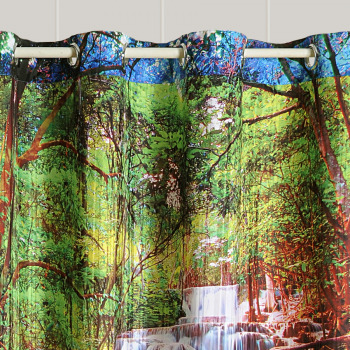 Everyday there will be some excitement to bathe when these digitally printed curtains will become a part of your restroom. Bring yourself close to the nature to forget about the chaos of life. 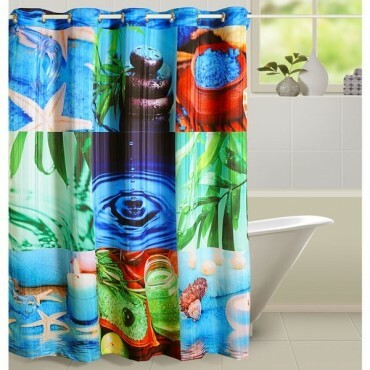 Divine bliss is hiding within the soothing visuals of these digitally printed curtains meant for exhilarating the bathroom experience. Don’t just take a shower; instead enliven your soul, mind as well as body to come out completely charged up for day-to-day challenges. These cute, adorable, pure white ducks are paddling towards the shore. Your eyes might agitate with their brilliant flawless radiance, so be cautious when you decide to concentrate on our white pearly ducklings. 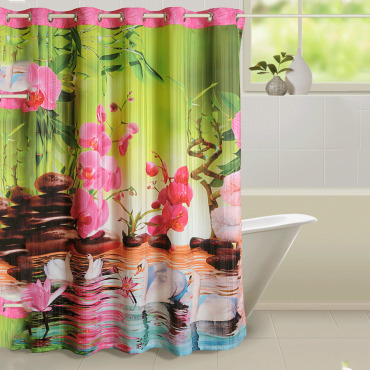 Pink blooms, long green stems along with brown pebbles are adding grace to the splendid beauty of our digitally printed curtains. 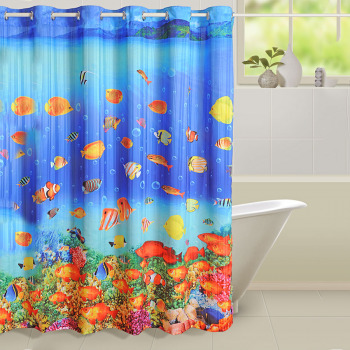 A style statement that will revolutionize and change the looks of bathrooms for a long time has finally arrived. Spreading the tranquility and serenity from its flawless appearance, these curtains will change the whole dimension of your bathroom. Recharge yourself with the recharged zeal buzzing with optimism that will fill you with the ultimate isle of calmness. 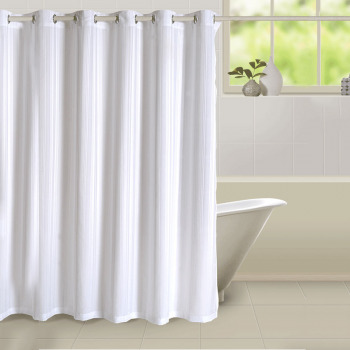 Spread the pleasure and cheeriness of the creamy comfort shower curtains from swayamindia.com on to your home and shower. The richness of the color will definitely impart a royal glow and sophistication. With such shades you can have different looks on different occasions. 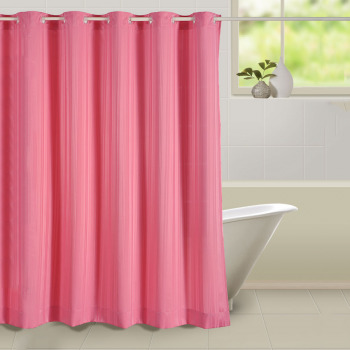 Give your shower time a new color every season with the pink passion shower curtains from the house of swayamindia.com. 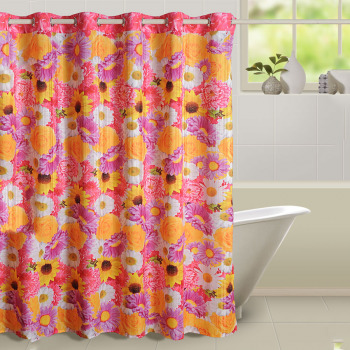 Making you blush in the bright reflections of the cute looking drapes they will always bring a smile on your face every morning you look at it. Drawing you towards itself it will inspire you to freshen up in the privacy it gives you. 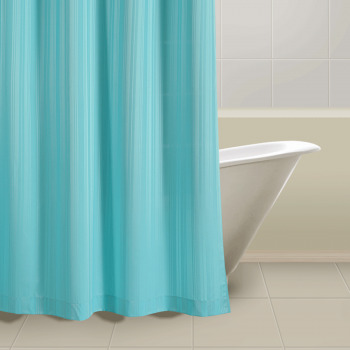 Keep your privacy intact in a stylish and trendy way with the blue blaze shower curtain from swayamindia.com. 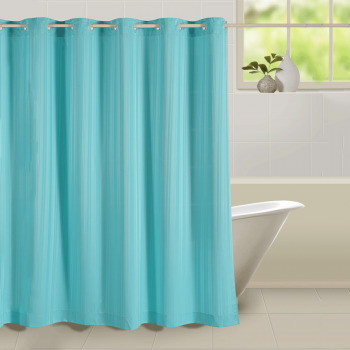 With the light and bright shade of the drape it will create a magical surrounding for you to have bath. Soothing hue will calm you down and give you a rejuvenated feeling. From sheer, unadulterated opulence to sophisticated traditional trims to the modern marvels, turn your bathroom into an enviable masterpiece. 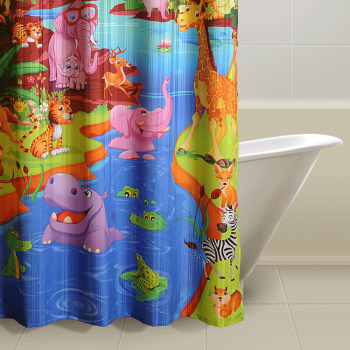 Shower curtain is the perfect way to enhance and accessorize your bathing space. They can make any bathroom look a perfect masterpiece. Although our bathrooms are the smallest room of our home, but it should not be overlooked. 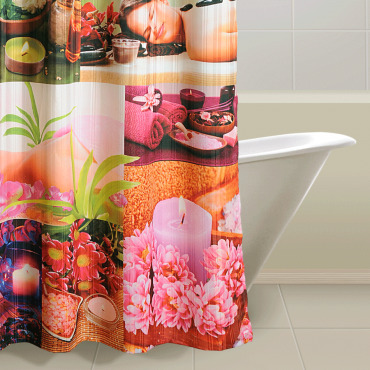 These draperies can give some serious dramatic effects to your bathroom. These bathroom curtains are generally hung on a shower pole to give a distinctive look to shower area and the rest of the space. 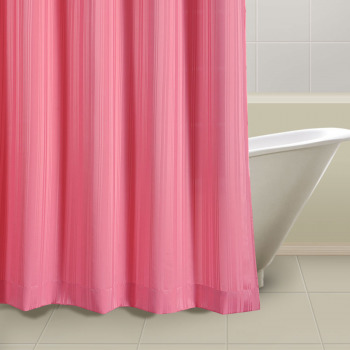 You can prevent water now from leaving the tub or shower area in style with these waterproof curtains. 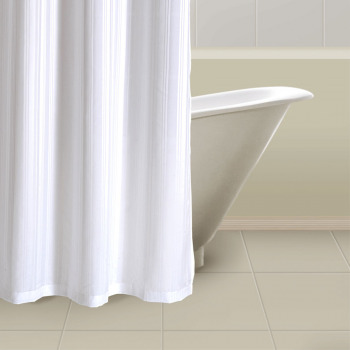 Functional, practical and great to look at, they let you enjoy privacy while serving as decorative features.If opulence is your opium, then you can find a great range of draperies for your bathing space online. 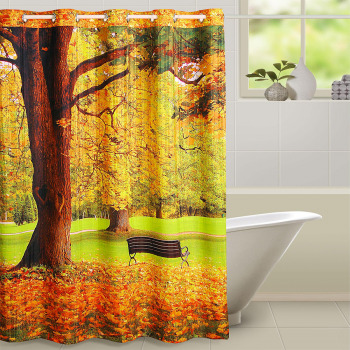 Give your bathroom a surreal effect of tranquility and buy shower curtains online from Swayam and make your bathing experience more relaxed. 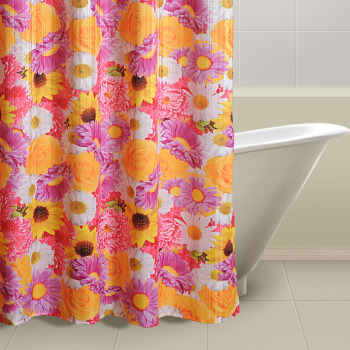 Available in lot of different patterns and exclusive designs you can pick any to suit your bathroom interiors. 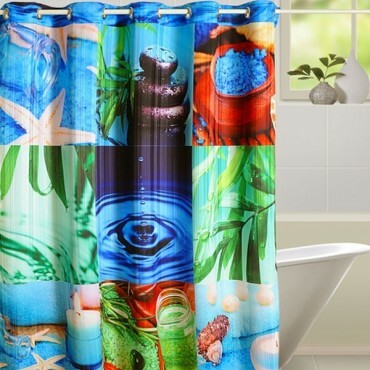 A bathroom with a bright and light design will beam with a new found glow with these bathroom curtains that are adorned with breath taking color combinations. 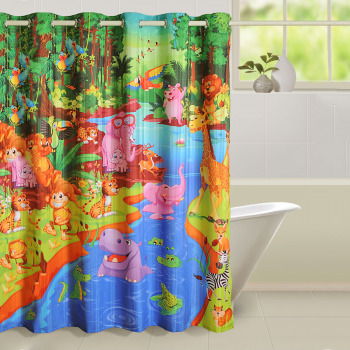 You can buy shower curtains online to make your bathroom a place that goes beyond functional aspects without forgetting the basics and yet stay stylish. 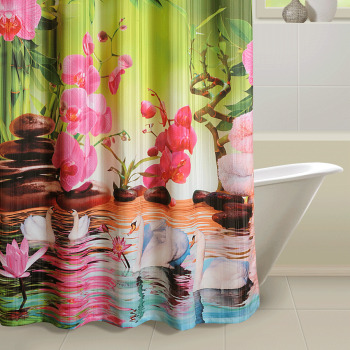 With intricate details and finest material they will surely give an elegant makeover to your bathroom. Let your bathroom speak the same language of style that you follow.